The fourth edition of this popular text is now expanded to better fit the needs of a standalone Texas Politics course. 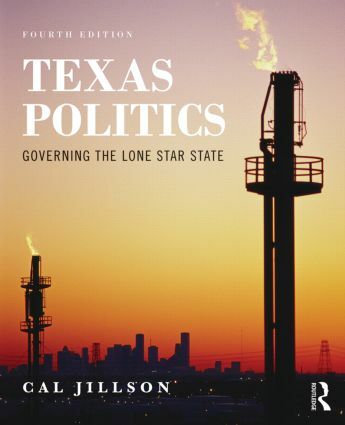 Jillson continues to approach the politics of the Lone Star State from historical, developmental, and analytical perspectives, while giving students the most even-handed, readable, and engaging description of Texas politics available today. Throughout the book students are encouraged to connect the origins and development of government and politics in Texas--from the Texas Constitution, to party competition, to the role and powers of the Governor--to its current day practice and the alternatives possible through change and reform. This text helps instructors prepare their students to master the origin and development of the Texas Constitution, the structure and powers of state and local government in Texas, how Texas fits into the U.S. federal system, as well as political participation, the electoral process, and public policy in Texas. Texas Politics offers instructors and students an unmatched range of pedagogical aids and tools. Each chapter opens with an engaging vignette and a series of focus questions to orient readers to the learning objectives at hand and concludes with a chapter summary, a list of key terms, review questions, suggested readings, and web resources. Key terms are bolded in the text, listed at the end of the chapter, and included in a glossary at the end of the book. Each chapter includes "Let's Compare" boxes to help students see how Texas sits alongside other states, and "Pro & Con" boxes to bring conflicting political views into sharper focus. Tables, figures, and photos throughout highlight the major ideas, issues, individuals, and institutions discussed.